Present state: The station frontage which was at one time a hotel has been converted into the Mercury Court office complex. 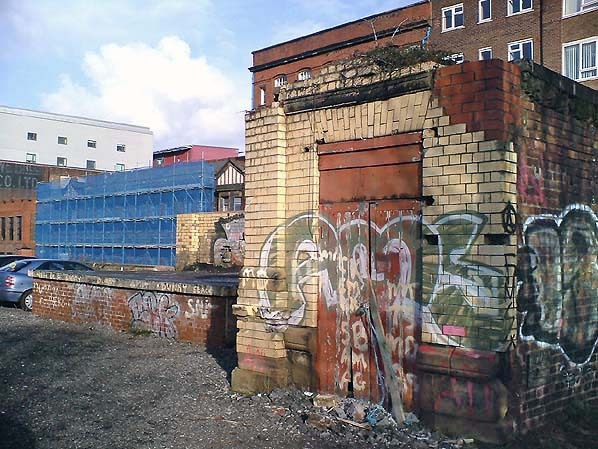 The train shed was demolished shortly after closure and the site is now a car park. Elements of the former station can still be seen throughout the car park site. Notes: Notes: Liverpool Exchange was on the northern side of the city centre in its business district on Tithebarn Street. It served the East Lancashire Railway’s (ELR) line to Preston, the Lancashire & Yorkshire Railway’s (LYR) route to Bolton and the Liverpool, Crosby & Southport Railway (LC&SR). powers to build it under the title of the Liverpool & Bury Railway. On 31st July 1845 a Liverpool & Bury Railway Act was passed, and work began in November of that year. The Liverpool and Bury Railway was absorbed into the Manchester & Leeds Railway on 27th July 1846 and that company became the LYR on 9th July 1847.
the two companies made uneasy bedfellows, and they could not even agree on a joint name for the station. The LYR favoured Borough Goal, after the nearby prison, whilst the ELR favoured Great Howard Street. Traffic levels built up to such a degree that the Great Howard Street terminus soon proved inadequate. A new terminus on Tithebarn Street in the city’s business district had been proposed even before the lines had opened. & Liverpool Canal. From Tithebarn Street ornamental steps and a 30ft-wide driveway sloped up to the frontage. The building was in the ‘Italian Style’. It was stone-built, consisted of two storeys, and was 117ft wide. Within the building were booking offices for both the LYR and the ELR. At right-angles to the building there were two single-storey wings that extended 193ft which contained refreshment rooms and waiting facilities for both companies. Behind the main building the five tracks were covered by two trainshed roofs: one was 638ft long, its span tapering from 136ft to 128ft without supports, and the other was 161ft long with a 78ft span. There was one arrival platform, 630 ft long, and two departure platforms - one for each company. The station was described by contemporaries as a ‘handsome piece of architecture’, and it seems to have been widely praised. The LYR was the dominant partner, and it was they who decided how the station would be divided. The LYR took the west side and left the ELR with the east. Even before it opened the ELR objected to the way the LYR had allocated facilities, a formal objection being lodged on 11th March 1850. This proved fruitless so they took their complaint to the Railway Commissioners, but it is not known what they decided at a meeting on 13th January 1851.
absorbed the LC&SR On 13th August 1859, the LYR also absorbed the ELR, from which date the only name of the station was Liverpool Exchange. Although the former LC&SR had been a minor railway serving sparsely populated areas, housing developments along the route brought many thousands of extra passengers into Exchange. The line continued to grow in importance as a commuter route throughout the second half of the 19th century. be lowered from its original elevated position, and this would be facilitated through alterations made to the Leeds & Liverpool Canal route. Henry Shelmadine was appointed architect of the new facilities, and his drawings were agreed on 8th November 1882. The contract for building the station was awarded to Robert Neill & Sons for £97,997 on 22nd July 1884. To minimise disruption to rail traffic the eastern side of the new station was built first alongside the existing station (on its east side). When the new station opened in part on 12th December 1886 (the eastern side) work could begin on the western side, and the remaining sections of the original station from 1850 were demolished. The new facilities opened completely 2nd July 1888. On 13th August 1888 the Exchange Hotel,which provided the frontage to the station, opened: it was owned and operated by the LYR and cost £140,000 to build. by shops. Steps led into the main area of the station; either side of them there were brick-built offices, refreshment rooms, parcels offices and staff accommodation. There were ten platforms beneath a ridged iron glazed roof that allowed light into the station. The platforms were numbered from the east side, platform 1 being the easternmost platform and platform 10 the westernmost. The platform faces were arranged as six ‘islands’. Between platforms 3 and 4 was a wide roadway for road vehicles to collect and deliver goods and parcels. They reached the roadway from a large entrance on the east side of the station, at the southern end of the platforms. In the circulating area, south of the platforms, were two timber booking offices, one to the east and the other to the west. The western office sold tickets for local services whilst the eastern one catered for long-distance passengers. Exchange Number 1 which was timber built and supported on legs above the running lines. In 1888 Liverpool Exchange had 115 departures and 115 arrivals which the new facilities easily accommodated. An hourly express to Manchester Victoria was intended to compete with the London & North Western Railway (LNWR) - which operated from Liverpool Lime Street station, and since the 1840s had owned the original Liverpool & Manchester Railway of 1830. A third company, the Cheshire lines Committee (CLC), had began to operate fast express services between the two cities in 1874, so competition was stiff. 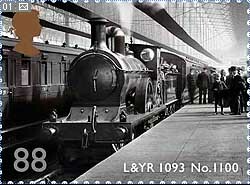 The LYR had the longest route but offered a 40-minute journey for its fastest trains. In the latter part of the 19th century over 300 staff worked at Liverpool Exchange. trains. Aspinall presented proposals to the LYR board on 28th May 1902, and in October of that year authorisation was given to create an electric route using a live rail to Southport and, beyond, to Crossens. Work began on 8th March 1903. At Liverpool Exchange platforms 6, 7, 8, 9 and 10were electrified. On 22nd March 1904 a partial electric service began, and from 5th April 1904 the Southport line passenger services went completely electric. A problem occurred at the main power station in Formby, and a full steam service had to be reintroduced on 11th April 1904. However it was rectified by 13th May and the electric operation was resumed. The service was a great success. So popular was it that there were 119 departures from Liverpool Exchange. Many ran only to Crosby but 65 continued to Southport Chapel Street; seventeen of the 65 went as far as Crossens. On 3rd December 1906 electrification progressed along the Preston line as far as Aintree, and over the next few years it was extended twice until it reached Ormskirk on the 1st April 1913.
the CLC shares passed to the London & North Eastern Railway (LNER). However, the LMS ran trains from all three Liverpool main line termini. 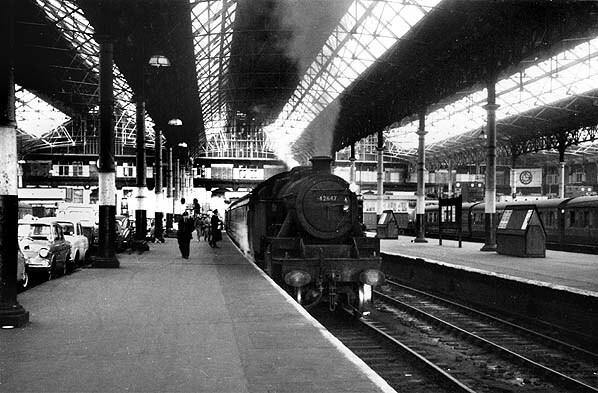 Despite this, competing services still ran between Liverpool and Manchester from all three stations, although the fastest LMS services went from Lime Street. (The services from Exchange were slowed to 45 minutes to ease the stress on the locomotives). With regard to long-distance services the LMS concentrated its Scottish expresses, Windermere, York and Newcastle services in Exchange. On 30th June 1929 an excursion train from Hull collided with the hydraulic buffers at platform 4. Thirty-eight injured passengers were removed to hospital, but of these all except two were discharged the same day; Forty others complained of injuries or shock but were not sent to hospital. A report into the accident blamed the driver for entering the station at too high a speed. light signals by 1940 when the project was halted. The Liverpool Blitz began on August 9th 1940. 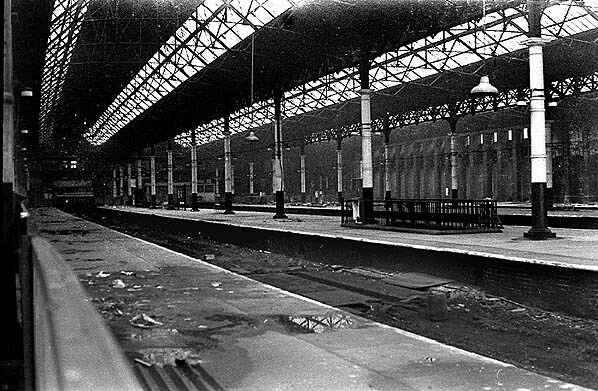 The city’s railways were a target for enemy bombers, and damage was caused to the approach lines to Liverpool Exchange. In December 1940 a viaduct north of the station received a direct hit and collapsed. 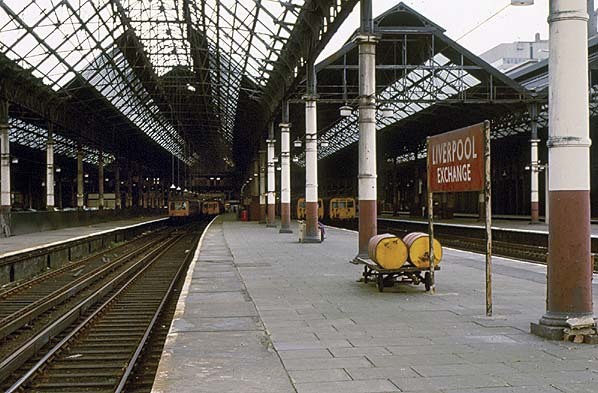 No trains were able to run into the station, so extra services were provided from the CLC Liverpool Central to Southport Lord Street to convey commuters. Although the route was much longer, the extra trains helped, and they ran from 24th December 1940 until 5th July 1941. Wooden trestle bridges were built over the site of the collapsed viaduct to enable electric services to be restored. The line reopened for them within days, but no steam-hauled main line services were able to run into Exchange until 18th August 1941: they terminated at Kirkdale, passengers transferring to buses or trams. In May 1941 Liverpool suffered the worst raids of the war, and a section of the roof at Liverpool Exchange was badly damaged and had to be demolished. The roof section was at the north end of the station on the west side. After June 1941 the raids eased off, with last being on 10th January 1942. 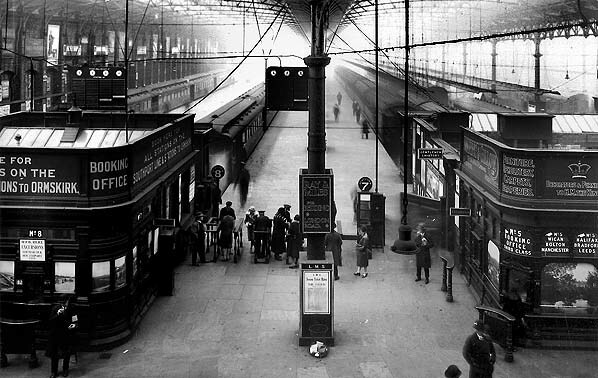 Train services at Liverpool Exchange did not return to normal until late 1942. In 1946 the colour-light signaling scheme was completed. On 1 January 1948 Liverpool Exchange became part of the nationalised British Railways (London Midland Region). At first services remained broadly similar to those in the LMS years. 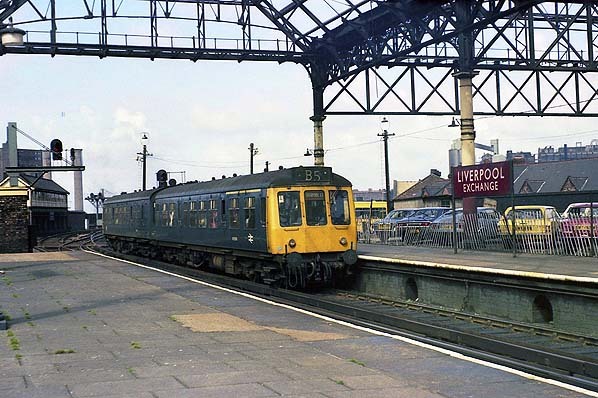 Electric commuter services remained frequent and busy, and longer-distance services to Manchester, Blackpool, east Lancashire, Yorkshire and Scotland ran from the station. On 2nd April 1951 the electric service to Aintree via Linacre Lane ceased. Only two stations closed as a result, and passengers could still reach Aintree on the direct route via Kirkdale; otherwise Liverpool Exchange remained very busy throughout the 1950s. ran to Southport and Ormskirk. In all there were 179 departures from the station. The first was a non-stop service to Preston with a connection to Glasgow leaving Liverpool Exchange at 1.45am. The last departure on weekdays was for Southport Chapel Street at 11:30pm. One of the most outrageous proposals of the Reshaping of British Railways (Beeching) Report 1963 was the closure of the Liverpool Exchange to Southport commuter route, as well as the line to Wigan Wallgate via Rainford Junction. To transfer rush-hour passengers from the efficient and heavily used Southport route to road transport seems incomprehensible unless – as suggested by cynics – it was to provide an opportunity for the Minister of Transport to reject a proposal, demonstrating that closure was not automatic. Liverpool Exchange–Ormskirk–Preston was not earmarked for closure by Beeching, but was reviewed and reprieved in 1966. Official publication of the Wigan Wallgate line closure proposals lwas on 15 November 1963, and closure was eventually refused on 20 December 1967. No record has been found in Hansard of the enquiry into the proposed closure of the Liverpool–Southport line. for Leeds Central whose first stop was Wallgate. On 5th March 1967 platforms 1, 2 and 3 were taken out of use. 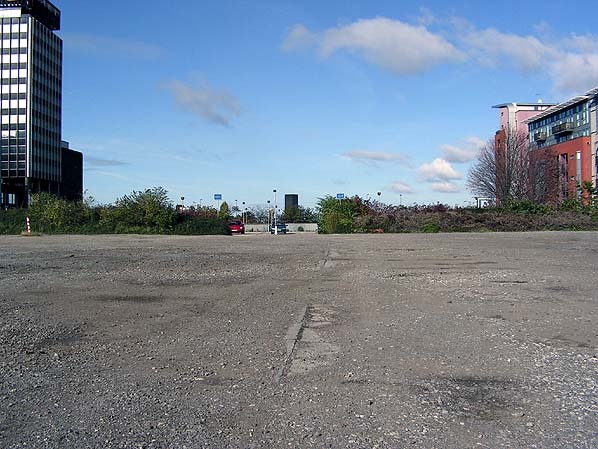 The tracks were soon removed and the area was infilled and used for car parking. This was probably due to the cessation of regular steam-hauled trains on local services. DMU’s had been introduced onto many of the non-electric services from 1960; DMU operation required fewer platforms. By summer 1968 the Liverpool Exchange to Glasgow Central Sunday expresses were the only remaining scheduled steam-hauled passenger services in Great Britain. Many enthusiasts headed to Liverpool Exchange at this time to photograph and travel on the last services. The last express services to Glasgow ran from Exchange on Sunday 3rd May 1970. Direct services to Preston finished the previous year. This left the station with only the electric services to Southport and Ormskirk and DMU’s to Bolton. The electric services still ran at a high frequency. MPTE branded the rail services within its area Merseyrail. The lines from Exchange to Southport, Ormskirk and Wigan Wallgate became part of the Merseyrail Northern Line - from Lime Street they became City Line and from Central Low Level they were Wirral Line. The Class 502 EMUs had Merseyrail applied to their coaches and the MPTE logo at each end near to the driving cabs. The MPTE had a vision for the railways of the region that would see them transformed into a modern high-frequency system similar to the London Underground. Building upon the MALTS (Merseyside Area Land Use Transportation Study 1966) the MPTE obtained an Act in 1971 to build an underground link line between Exchange and Central stations and a loop from James Street (on the former Mersey Railway) via Exchange, Lime Street and Central stations back to James Street. The advantage for passengers using lines out of Exchange was that trains would serve Liverpool Central in the city’s shopping centre. A new underground station would be provided at Moorfields, on the south side of Tithebarn Street to replace Exchange station. electrified. Southport services tended to use platforms 6 and 7, leaving 4 and 5 to the Bolton and Ormskirk services. The station took on a derelict air although efforts were made to keep the active parts of the station clean and tidy, and corporate blue was applied to the pillars at platforms 4, 5, 6 and 7. It made an interesting contrast to the faded London Midland Region colours on pillars adjacent to the car park where platforms 1, 2 and 3 had been. During the last year of passenger services there were fifteen weekday departures for Bolton. The first left Liverpool Exchange at 07:04 and the last at 21:43. On Saturdays there was an additional late departure for Bolton at 22:37. There were also fifteen arrivals from the Bolton line on weekdays, the first at 06:44, but it originated from Wigan Wallgate. The last arrival was at 22:06 on weekdays, but on Saturdays there was a Bolton train at 23:42. There was no Sunday service to Wigan Wallgate or Bolton. There were 56 departures for Ormskirk on weekdays. Thirteen of the trains had onward connecting services to Preston from Ormskirk. On Sundays there were 22 Ormskirk departures but no onward connections to Preston. The Southport line was the busiest with trains running at least every twenty minutes on weekdays from early morning to late evening. The last departure from Liverpool Exchange was at 23.35 on Friday 29th April 1977: a special service to mark the station’s closure. It ran to Liverpool Lime Street - which lay less than a mile away - via Wigan Wallgate. Although the station officially closed the next day its booking offices remained open until Monday 2nd May, issuing tickets for the usual destinations, but on replacement bus services. Both Liverpool Exchange No 1 and No 2 signal boxes were manned until Sunday 1st May 1977 although no trains actually ran. The signalmen were on duty to oversee asset recovery operations. Shortly after the last train had departed on the Friday night the approach lines to Exchange were disconnected at the point where the link line diverged. Northern Line passenger trains served Liverpool Moorfields station from 3rd May 1977, the first departure from Moorfields being for Southport at 06:07. The original Liverpool Exchange station looking north from Tithebarn Street, nine days before the station opened. 1864 1:1056 town plan. 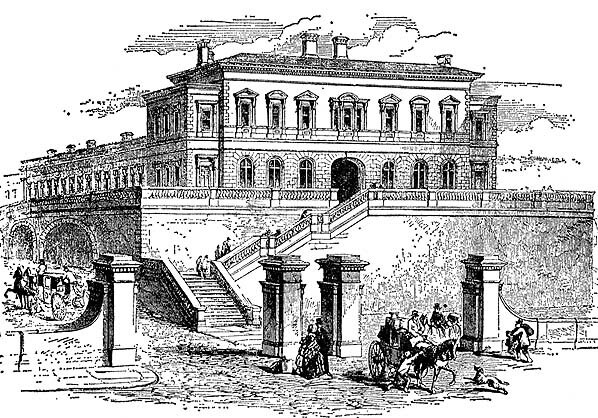 Liverpool Exchange station as it was in 1864. The map shows the station that had opened in 1850. Clearly shown are the approach roads that climbed up to the station which was elevated above the street. Although in 1864 Tithebarn Street was one of the city’s major thoroughfares and home to many businesses and ‘persons of quality’ the areas of housing to the north-east of the station were notorious slums that caused the city authorities much concern. On 3 August 1874 a savage murder was committed on Tithebarn Street close to Liverpool Exchange station when Richard Morgan, his brother Samuel Morgan and his wife, Alice, were attached at 9.25pm by a gang of youths who inhabited the slum area. Richard Morgan was kicked to death in a savage manner. Although the street was busy nobody helped him. Samuel, being a powerful man, was able to remain on his feet, fending off attacks. Only the arrival of a railway policeman from Liverpool Exchange station stopped the attack, but it was too late. Samuel chased the gang into the slum area shown on the map, but he was chased off by the inhabitants. The crime made national headlines and caused a great furore and some soul-searching about how a civilised society could have allowed such a thing to happen. Two youths were hanged and one was given a sentence of life imprisonment with hard labour. 1864 1:500 town plan showing the arrangement of the rebuilt Liverpool Exchange station, completed in 1888, at its Tithebarn Street end. The new station had a hotel building and main entrance that fronted directly onto Tithebarn Street. The old station had been set back from the street in an elevated position. The map shows that behind the hotel building there was a cab road, under cover, followed by further buildings; these were followed by the station concourse and then the platforms. As well as the main entrance on Tithebarn Street the map shows entrances from Pall Mall on the eastern side of the station. 1893 1:2500 OS map. 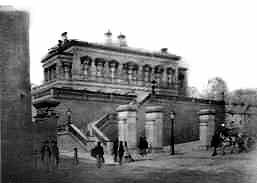 Liverpool Exchange station in its 1888 re-built form. Comparison with the 1864 map shows that there had been extensive demolition to accommodate a much bigger station. The demolished property had been of very poor quality and a nest of criminality and violence. The LYR had no difficulty persuading the City Council to agree to its plans for a bigger station involving demolition of part of this area. 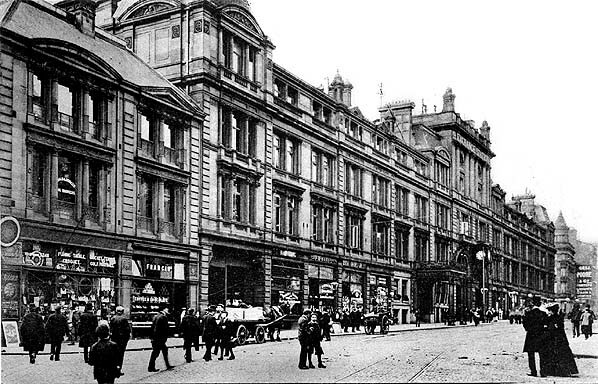 Liverpool Exchange station looking eastwards from Tithebarn Street in 1904. The stone-built station hotel dominates the street view which changed radically when the station was completely rebuilt in the mid 1880s. The original station of 1850 (see above) had been above street level and set back from Tithebarn Street. It had sloping approach roads up to its main entrance. The new station, seen here, faced directly onto the street, although the platforms were set further back behind the hotel building, a cab road and a concourse. of part of this area. In April 1965 a stopping service for either Bolton or Rochdale prepares to depart from Liverpool Exchange station’s platform 4, on the east side of the station. It was one of the platforms which were not electrified. 42647 was built in 1938 at Derby works to a Stanier 2-6-4 design for the LMS. A class 4 passenger tank, this loco lasted until it was withdrawn from 8H, Birkenhead Shed on 13.5.1967 and cut up in November of that year at Cashmores of Newport. When this picture was taken, it was allocated to 8F, Springs Branch Shed, Wigan. 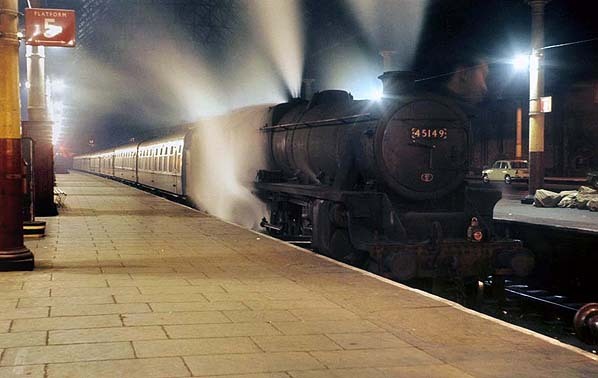 A Stanier Black 5 stands at the buffer stops at platform 5 of Liverpool Exchange station in March 1968 with a class A express passenger working from Preston to Liverpool Exchange. 45149 was built in June 1935 by Armstrong Whitworth for the LMS. Having a working life of 33 years, it lasted well into the last year of BR steam, being withdrawn in June 1968 from 10D, Lostock Hall Shed; it was cut up by Drapers of Hull in January 1969. 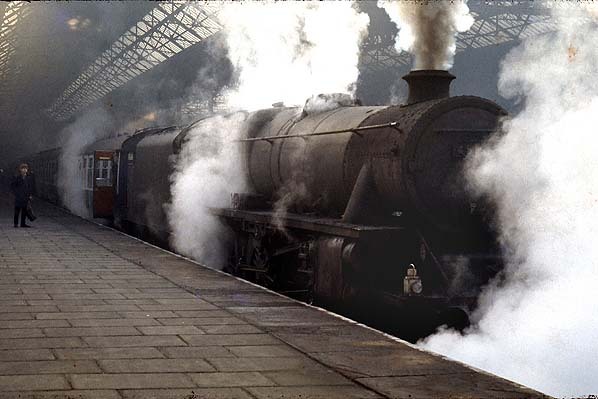 The last scheduled steam-hauled passenger trains on the British Railways’ network ran between Liverpool Exchange and Preston in July and into August 1968. By that time the motive power tended to be in a poor condition, as illustrated by this Class 5MT (Black 5) at Liverpool Exchange heading a Glasgow train during the last days of steam. The steam locomotive would have hauled the train only as far as Preston where a diesel would take over. bomb damage in World War II. TThe 12.15 from Bolton arrives at Liverpool Exchange. The station was due to close and has an air of decrepitude in September 1975. 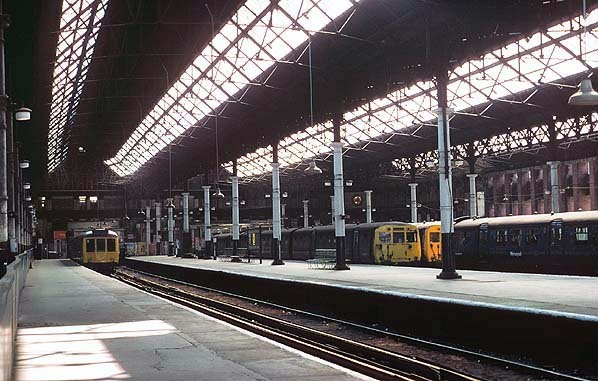 Looking towards the buffers at Liverpool Exchange shortly before the station’s closure in April 1977. To the left a two-car Derby-built DMU waits to depart for either Bolton or Manchester Victoria. Towards the right the LMS EMUs date from 1938. At this time they operated to Southport and Ormskirk. By April 1977 only four platforms were in use. Looking south into the station from its north end in 1978. The picture gives a good overall view and shows six of the original ten platforms. To the right, on the platform is a fenced set of steps leading via a subway to Pall Mall, on the eastern side of the station. 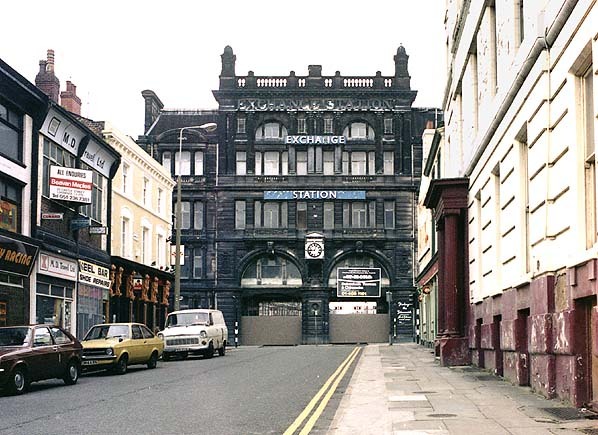 Looking north towards the derelict Liverpool Exchange station main entrance in May 1981. A platform remnant seen in January 2005. Looking north in October 2010 along the vehicle access road that ran between platforms 3 and 4 at Liverpool Exchange. The kerb edges formed the eastern side of the road. Platform 3 was to the right of the picture and 4 to the left.